HeatRx is proud to provide the Bay Area effective, affordable and timely bed bug heat treatments. We will provide a detailed written estimate with every bed bug inspection. 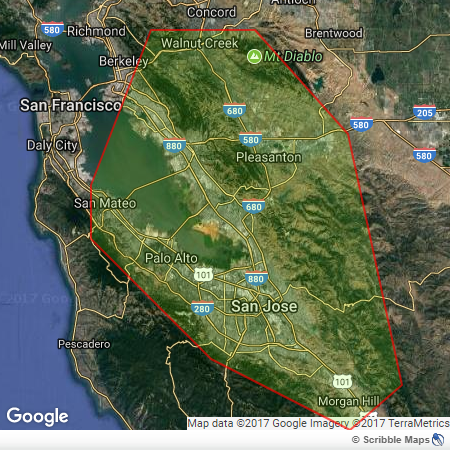 We service the Bay Area within about 45 minutes of San Jose, California. The list below is not comprehensive so if you don't see your city in the list below don't panic-- simply give us a call. We can probably help you out. Bed bugs cannot live for long in temperatures that exceed 120 degrees. HeatRx is proud to provide the Bay Area an effective, natural and chemical free way to get rid of bed bugs. Our prescription is HEAT! It is safe, fast and has a 100% success rate. Want to learn more about HeatRx? Bed bugs are the worst. We can get bed bugs out of your life FAST and FOREVER! We use the best equipment to eliminate bed bugs. We are happy to offer the Bay Area FREE bed bug inspections. We will find the bugs giving you trouble and give you a written quote for services. Give us a call or text (510) 244-2301.